The Intergenerational Landed Learning on the Farm for the Environment Project began in 2002 and for the first two years operated with one teacher, a class of 18 grade seven students, and seven community elders with farming and gardening backgrounds who became “Farm Friends”. Each farm elder partnered with three students to form six “Farm Friend teams.” Between January and June, the students visited the UBC Farm to meet and work with their farm friends on thirteen occasions. The teams cultivated the soil, grew plants and discussed different environmental and scientific issues that related to farming and gardening. The students interviewed their elderly farm friends about farming practices and learned about their history and lives on the land. Students maintained a journal documenting their farming activities. Small scientific “controlled” experiments were planned and carried out. These were also recorded in the students’ journals. At the close of the project year in June, students gave class presentations that visually represented their experiences on the farm and what they had learned about the environment, planting, farming practices and living with the land, from conducting experiments and working with their farm friends. 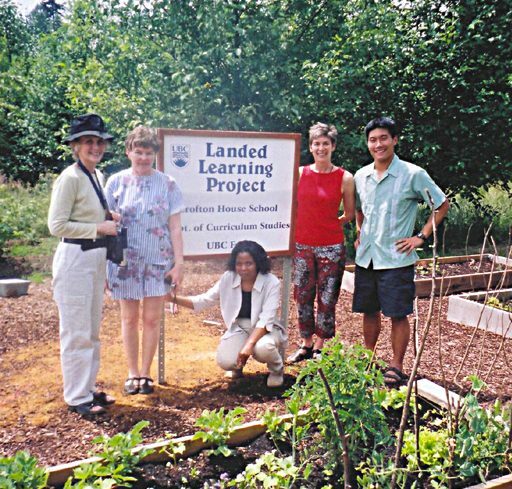 Since 2004-05 the Landed Learning School Year Program has continued to work each year with three classes of students who now come from three different Vancouver schools. 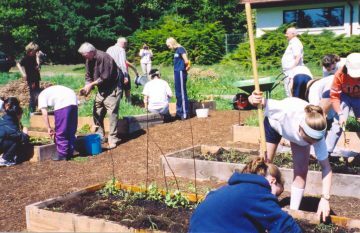 In 2006-07, the program became multi-generational when undergraduate and graduate students at UBC asked to be involved as Farm Friends. With their addition we created a model for small group multigenerational learning. Multigenerational Farm Friend teams include one undergraduate or graduate student, a senior volunteer, and three or four children. In summer 2010 we began The Sustainable Opportunities for Youth Leadership (SOYL) Internship Program for adolescents. SOYL has helped eight Vancouver teenagers to become environmental leaders through establishing and maintaining school gardens, and learning about food security in their schools and communities. SOYL is now a self-sustaining program serving dozens of youth each year, run in partnership with Fresh Roots. Landed Learning has offered dozens of professional development workshops for teachers in Vancouver and across BC. Since the inception Landed learning has reached over 1500 students, 500 volunteers and hundreds of teachers. The Intergenerational Landed Learning Project has become a model for other programs across British Columbia and Canada. Programs modeled on Intergenerational Landed Learning have begun with kindergarten children in St. Andrews, NB. The Terra Nova Project was started in Richmond, BC and the Intergenerational Landed Learning Project at the Okanagan Science Centre in Vernon, BC. This speech, given on the occasion of the retirement of Dr. Jolie Mayer-Smith, tells the inspiring story of the Intergenerational Landed Learning Project and the campaign to save the UBC Farm.